These cookies are coming with me, packed ever so carefully in layers of parchment and tissue, nestled in a holiday box for my dear friend Marcia of Polas Pilates. We met via a mutual friend on Twitter, and her subsequent visits to New York sealed in a friendship I am so lucky to have. This is my first trip out west to see her, as well as one of my darlingest friends (whose private chef job I took over when he moved to Denver), and one of my cousins, who I have publicly stated amongst my family far too often has always been my favorite. I’m so excited to see this special group of people. And to go almost straight from the airport to a hot springs resort. As a woman who takes a long, hot bath almost daily, I’m a bit giddy at the idea of sinking into steaming springs whilst being surrounded by snow! On her last trip out, Marcia and I went to dinner downtown at Risotteria, which has gluten-free bread and risotto and sweets galore. She loved their gluten-free Raspberry Linzer cookies so much she took half a dozen home with her. Since I’m not in that part of town often, I figured I’d just make my own. 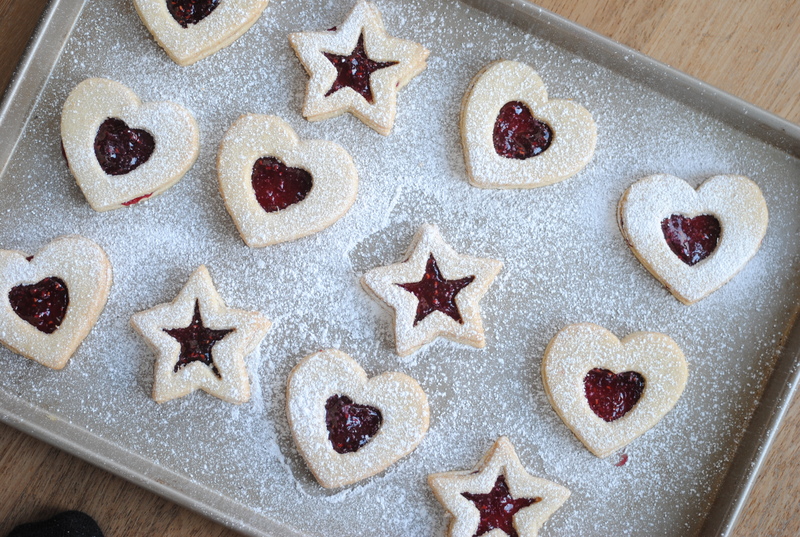 This is not nearly the first batch of Linzers I’ve made, but it’s by far my favorite. They have a higher almond ratio than many recipes, so they’re particularly nutty and crisp. And with no baking powder or soda, they retain their shape well and are full of buttery perfection. A smidgen of lemon zest, cinnamon and vanilla extract add a bit of depth without overwhelming the simplicity of them. Altogether, they’re one of my favorite cookies; simple, classic, and truly delicious. I tried making some in festive little human shapes (like Gingerbread men), but the delicate nature of the cookie was too much for the detail of my cutters. In general, I’d say go with cutouts that are rather sturdy. They definitely won’t ship well, but will make a classy addition to a holiday cookie plate or hostess gift. Or for one of your very favorite people who happens to have Celiac disease. Because these cookies definitely don’t taste like they’re lacking in anything, and they’re overflowing with love. These cookies are rather easy to make, but they do take a bit of planning since they work and taste better with periods of refrigeration. Make sure to have your butter solidly at room temperature, don’t skimp on the creaming step, and work gingerly with the dough. Have no fear – it rolls well! Choose sturdy cookie cutters to minimize breaking when filled, and layer gently upon storing. They’ll keep for about a week refrigerated. In a medium bowl, whisk all flours, gum, cinnamon and salt. In another small bowl, whisk together almond flour and 50g of the sugar (1/4 cup). With a hand mixer or a standing mixer with the whisk attachment, beat butter and remaining 100g (1/2 cup) sugar on medium/high speed, until light and fluffy, about 3 minutes. Add the egg yolks and vanilla, and beat on medium and then high speed for another 3 minutes. The mixture should be pale and delightfully fluffy, and the sugar should be completely dissolved in the butter and eggs. Add flour, almond and lemon zest, and mix in on slow. It will start to look like there’s not enough moisture in the batter – there is! Just continue mixing, scraping the beater blades and the sides of the bowl as necessary, until it pulls together into a dough. It’s best to let the machine do this and not your hands. When the dough pulls together, divide in half, flatten each half into a disk, wrap in plastic wrap, and refrigerate for at least an hour (or up to two days). The dough will come out of the fridge rather hard, but will soften very quickly. When ready to bake, preheat oven to 350 degrees and line two large cookie sheets with parchment paper or Silpat. On a floured surface (I used wax paper on top of a cutting board, dusted with white rice flour), roll out one disk until it’s about 1/4″ thick. Cut desired shapes and move onto cookie sheet. Use a smaller cookie cutter to cut out the second of every other cookie (these tiny cookies are great for baking and munching – and they’re so cute!). Re-roll scraps as necessary, putting back into fridge to harden up if the dough gets too soft. Bake for 11-12 minutes, until the cookies are just slightly brown on the edges. Roll, roll, cut, cut, cut and bake, bake, bake! 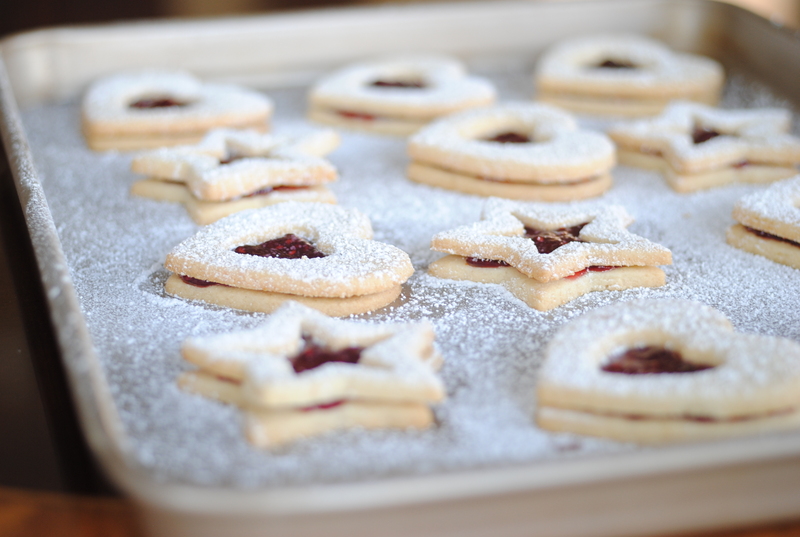 To finish, dust with confectioners sugar and fill with a thin layer of jam. I was wondering what other nut flour could be substituted for the almond flour. I have a friend who is allergic to almonds so this wouldn’t be good to give to her. Any suggestions very much appreciated. Awesome recipe for some great looking biscuits – very festive! These are so pretty and festive. I can’t wait to try them out. :) Thank you for your supports in the Online bake sale on Tina’s blog. So glad to be part of it as that’s how I found out about your awesome blog. :) Can’t wait to see more of your recipes.